A dialogue with the self may seem passé in an online world where we are confronted more by other people’s lives than our own. But here is an artist whose oeuvre of work intentionally focuses on ‘finding the inner voice’ by physical presence and exchange generated by the interactions of human beings. “Nowadays, we perceive things with certain intelligence as we receive a lot of information. But there is no physical experience of space, taste, touch and so on. These are virtualised. Hence, I want to make it possible for us to be more concentric in our physical experience and discover something new of the self in the process,” explains Kyungwoo Chun of his unconventional experiments in performance art as well as photography, which have been well received the world over, right from his native Seoul, to Germany where he lives, to Europe and the USA. 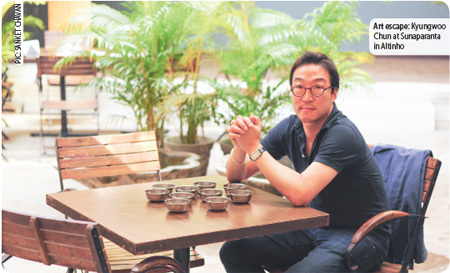 Arranging meetings and interactions with groups of people he does not know and who are unrelated to each other, sometimes ranging from 1,000 participants to just two, Chun avers that the process is an experience for the participant as well as the public. “I draw the ideas from moments of everyday life and try to give it a new perception. I initiate the process, but I share it as a co-author with my participants. I let them interpret the role as they like while tapping on their innermost sensibilities. I initiate the situation where they not only confront their own nature, but that of others. Through simple gestures, I invite a shift in perception – how we wish to be seen or how we relate to those around us,” explains Chun of the process, which, he reveals, evokes new experiences every time he tries it with a new group/individual. In the realm of photography, his images are intentionally blurred. “They are in fact sharp. The blurred image is a reference to the time and experience in extracting the actual self. It may take a while, but the realisation of the entire picture dawns slowly,” explains Chun. On his first ever trip to India and Goa, he is enamoured with the country of myriad languages, cultures and religions and the interaction of the people thereof. A subject most suited to his unconventional experiments, the first of which he will conduct today in Goa.